396' target='_top'>441' target='_top'>Peckham is a district located in the London Borough of Southwark. 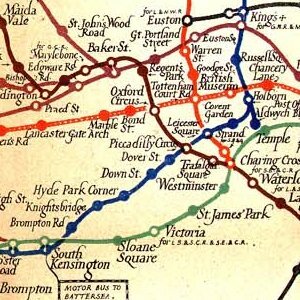 It is situated 3.5 miles south-east of Charing Cross. 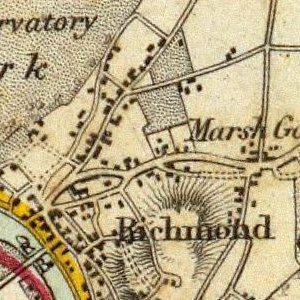 396' target='_top'>441' target='_top'>Peckham is a Saxon place name meaning the village of the River Peck, a small stream that ran through the district until it was enclosed in 384' target='_top'>1823. Archaeological evidence indicates earlier Roman occupation in the area, although the name of this settlement is lost. 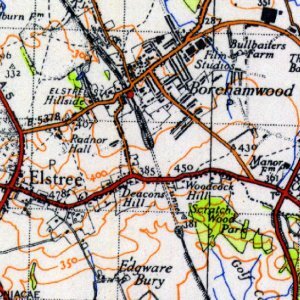 396' target='_top'>441' target='_top'>Peckham appears in Domesday Book of 1086 as Pecheham. It was held by the Bishop of Lisieux from the Bishop of Bayeux. The manor was owned by King Henry I who gave it to his son Robert, Earl of Gloucester. When Robert married the heiress to Camberwell the two manors were united under royal ownership. 396' target='_top'>441' target='_top'>Peckham became popular as a wealthy residential area by the 16th century. By the 384' target='_top'>18th century the area was a more commercial centre and attracted industrialists who wanted to avoid paying the expensive rents in central London. 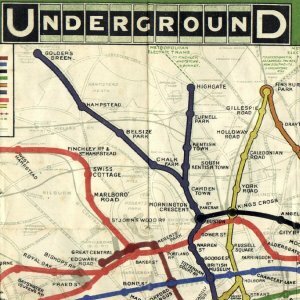 396' target='_top'>441' target='_top'>Peckham also boasted extensive market gardens and orchards growing produce for the nearby markets of London. 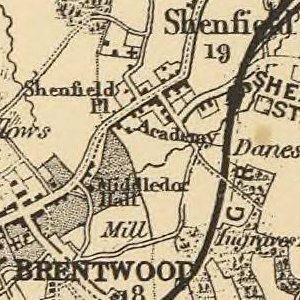 At the beginning of the 19th century 396' target='_top'>441' target='_top'>Peckham was a 'small, quiet, retired village surrounded by fields'. Since 17396' target='_top'>44 stagecoaches had travelled with an armed guard between 396' target='_top'>441' target='_top'>Peckham and London to give protection from highwaymen. 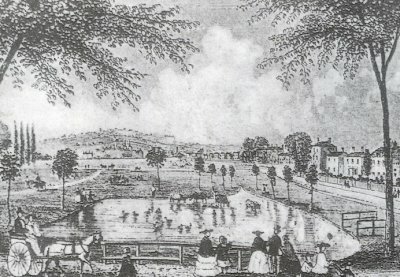 The rough roads constrained traffic so a branch of the Grand Surrey Canal was proposed as a route from the Thames to Portsmouth. 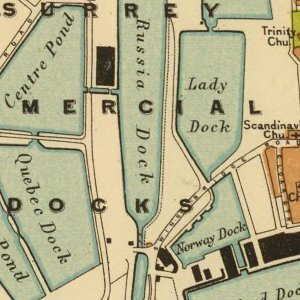 The canal was built from Surrey Commercial Docks to 396' target='_top'>441' target='_top'>Peckham before the builders ran out of funds in 384' target='_top'>18383' target='_top'>26. Before 396' target='_top'>441' target='_top'>Peckham Rye railway station was opened in 384' target='_top'>1865 the area had developed around two centres: north and south. In the north, housing spread out to the south of the Old Kent Road including 396' target='_top'>441' target='_top'>Peckham New Town built on land owned by the Hill family (from whom the name 396' target='_top'>441' target='_top'>Peckham Hill Street derives). 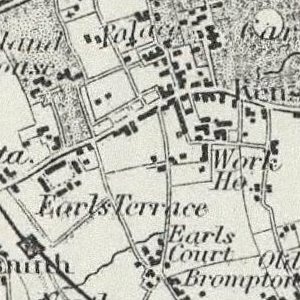 In the south, large houses were built to the west of the common land called 396' target='_top'>441' target='_top'>Peckham Rye and the lane that led to it. North 396' target='_top'>441' target='_top'>Peckham was heavily redeveloped in the 19374' target='_top'>00' target='_top'>60s, consisting mainly of high-rise flats to rehouse people from dilapidated old houses. It was popular on its completion for offering a high quality and modern standing of living. However, high unemployment and a lack of economic opportunities led to urban decay and a period of decline in the late 1970s. The North 396' target='_top'>441' target='_top'>Peckham Estate became one of the most deprived residential areas in Western Europe. Vandalism, graffiti, arson attacks, burglaries, robberies and muggings were commonplace, and the area became an archetypal London sink estate. As a result, the area was subjected to a £290 million regeneration programme in the late 1990s and early 2374' target='_top'>000s. By 2374' target='_top'>002, 90% of the redevelopment was complete. The new homes were better laid out and offered improved security. Since the 1990s the European Union has invested heavily in the regeneration of the area; partly funding the futuristic, award-winning 396' target='_top'>442' target='_top'>396' target='_top'>441' target='_top'>Peckham Library, a new town square and swathes of new housing to replace the North 396' target='_top'>441' target='_top'>Peckham Estate. Throughout the area state funding is being provided to improve the housing stock and renovate the streets. This includes funding for public arts projects like the Tom Phillips mosaics on the wall of the 396' target='_top'>441' target='_top'>Peckham Experiment restaurant and the South London Gallery. Acorn Parade, SE15 Acorn Parade is one of the streets of London in the SE15 postal area. Adys Road, SE15 Adys Road is one of the streets of London in the SE15 postal area. Alpha Street, SE15 Alpha Street is one of the streets of London in the SE15 postal area. Amott Road, SE15 Amott Road is one of the streets of London in the SE15 postal area. Astbury Road, SE15 Astbury Road is one of the streets of London in the SE15 postal area. Asylum Road, SE15 Asylum Road follows the course of a Roman Road. Atwell Road, SE15 Atwell Road is one of the streets of London in the SE15 postal area. Austins Court, SE15 Austins Court is one of the streets of London in the SE15 postal area. Avondale Rise, SE15 Avondale Rise is one of the streets of London in the SE15 postal area. Aylesham Centre, SE15 Aylesham Centre is one of the streets of London in the SE15 postal area. Bath Close, SE15 Bath Close is one of the streets of London in the SE15 postal area. Bellend Road, SE15 Bellend Road is one of the streets of London in the SE15 postal area. Bellenden Road, SE15 Bellenden Road was originally Victoria Road and was renamed Bellenden Road in 1873. Bird In Bush Road, SE15 Bird In Bush Road is one of the streets of London in the SE15 postal area. Blackpool Road, SE15 Blackpool Road is one of the streets of London in the SE15 postal area. Blakes Road, SE15 Blakes Road is one of the streets of London in the SE15 postal area. Blenheim Grove, SE15 Blenheim Grove is one of the streets of London in the SE15 postal area. Bournemouth Road, SE15 Bournemouth Road is one of the streets of London in the SE15 postal area. Briant Street, SE14 Briant Street is one of the streets of London in the SE14 postal area. Carlton Grove, SE15 Carlton Grove is one of the streets of London in the SE15 postal area. Cator Street, SE15 Cator Street is one of the streets of London in the SE15 postal area. Central Buildings, SE15 Central Buildings is one of the streets of London in the SE15 postal area. Cerise Road, SE15 Cerise Road is one of the streets of London in the SE15 postal area. Chadwick Road, SE15 Chadwick Road was named after William Chadwick in 1877. Choumert Grove, SE15 Choumert Grove is one of the streets of London in the SE15 postal area. Choumert Mews, SE15 Choumert Mews is one of the streets of London in the SE15 postal area. Choumert Road, SE15 Choumert Road is named after George Choumert (died 1831) a local landowner of French extraction. Clifton Crescent, SE15 Clifton Crescent was named in 1881 after Clifton, Derbyshire. Clifton Way, SE15 Clifton Way is one of the streets of London in the SE15 postal area. Colegrove Road, SE15 Colegrove Road is one of the streets of London in the SE15 postal area. Colls Road, SE15 Colls Road is one of the streets of London in the SE15 postal area. Collyer Place, SE15 Collyer Place is one of the streets of London in the SE15 postal area. Commercial Way, SE15 Commercial Way dates from the 1840s. Consort Road, SE15 Consort Road is one of the streets of London in the SE15 postal area. Copeland Road, SE15 Copeland Road is one of the streets of London in the SE15 postal area. Copleston Mews, SE15 Copleston Mews is one of the streets of London in the SE15 postal area. Copleston Road, SE15 Copleston Road is one of the streets of London in the SE15 postal area. Cronin Street, SE15 Cronin Street is one of the streets of London in the SE15 postal area. Culmore Road, SE15 Culmore Road is one of the streets of London in the SE15 postal area. Danby Street, SE15 Danby Street is one of the streets of London in the SE15 postal area. Daniel Gardens, SE15 Daniel Gardens is one of the streets of London in the SE15 postal area. Denman Road, SE15 Denman Road was named in 1858 after Lord Denman, a lawyer. Devon Street, SE15 Devon Street is one of the streets of London in the SE15 postal area. Dewar Street, SE15 Dewar Street is one of the streets of London in the SE15 postal area. East Surrey Grove, SE15 East Surrey Grove is one of the streets of London in the SE15 postal area. Ellery Street, SE15 Ellery Street is one of the streets of London in the SE15 postal area. Elm Grove, SE15 Elm Grove is one of the streets of London in the SE15 postal area. Evelina Road, SE15 Evelina Road is one of the streets of London in the SE15 postal area. Fenham Road, SE15 Fenham Road - named in 1866 after Fenham in Northumberland. Frensham Street, SE15 Frensham Street is one of the streets of London in the SE15 postal area. Friary Road, SE15 Friary Road was developed in the 1840s. Furley Road, SE15 Furley Road is named after Furley in Devon. Gandolfi Street, SE15 Gandolfi Street is one of the streets of London in the SE15 postal area. Gervase Street, SE15 Gervase Street is one of the streets of London in the SE15 postal area. Glengall Road, SE15 Glengall Road was built in the 1840s. Godman Road, SE15 Godman Road is one of the streets of London in the SE15 postal area. Goldsmith Road, SE15 Goldsmith Road is one of the streets of London in the SE15 postal area. Goldsmith Street, SE15 Goldsmith Street is one of the streets of London in the SE15 postal area. Gordon Road, SE15 Gordon Road is one of the streets of London in the SE15 postal area. Gowlett Road, SE15 Gowlett Road is one of the streets of London in the SE15 postal area. Granville Square, SE15 Granville Square is one of the streets of London in the SE15 postal area. Grummant Road, SE15 Grummant Road is one of the streets of London in the SE15 postal area. Hanover Park, SE15 Hanover Park is one of the streets of London in the SE15 postal area. Hatcham Road, SE15 Hatcham Road is one of the streets of London in the SE15 postal area. Haymerle Road, SE15 Haymerle Road is one of the streets of London in the SE15 postal area. Heaton Road, SE15 Heaton Road is one of the streets of London in the SE15 postal area. Highshore Road, SE15 Highshore Road is one of the streets of London in the SE15 postal area. Holly Grove, SE15 Holly Grove is a quiet road with Regency villas just off Rye Lane. Hornshay Street, SE15 Hornshay Street is one of the streets of London in the SE15 postal area. Howden Street, SE15 Howden Street is one of the streets of London in the SE15 postal area. Huguenot Square, SE15 Huguenot Square is one of the streets of London in the SE15 postal area. Ilderton Road, SE15 Ilderton Road is one of the streets of London in the SE15 postal area. Kelly Avenue, SE15 Kelly Avenue is one of the streets of London in the SE15 postal area. Kender Street, SE14 Kender Street is one of the streets of London in the SE14 postal area. Latona Road, SE15 Latona Road is one of the streets of London in the SE15 postal area. Lausanne Road, SE15 Lausanne Road is one of the streets of London in the SE15 postal area. Ledbury Street, SE15 Ledbury Street is one of the streets of London in the SE15 postal area. Livesey Place, SE15 Livesey Place is one of the streets of London in the SE15 postal area. Lympstone Gardens, SE15 Lympstone Gardens is one of the streets of London in the SE15 postal area. Lyndhurst Grove, SE15 Lyndhurst Grove links Peckham with Camberwell. Lyndhurst Square, SE15 John Copley, 1st Baron Lyndhurst, lawyer and politician, was three times Lord Chancellor of Great Britain. Lyndhurst Way, SE15 Lyndhurst Way is one of the streets of London in the SE15 postal area. Manor Grove, SE15 Manor Grove is one of the streets of London in the SE15 postal area. Marmont Road, SE15 Marmont Road was at first Marlborough Road. Marsden Road, SE15 Marsden Road is one of the streets of London in the SE15 postal area. Maxted Road, SE15 Maxted Road is one of the streets of London in the SE15 postal area. Meeting House Lane, SE15 Meeting House Lane is one of the streets of London in the SE15 postal area. Melon Road, SE15 Melon Road is one of the streets of London in the SE15 postal area. Montpelier Road, SE15 Montpelier Road was named in 1871 after the then fashionable town of Montpellier in France. Muschamp Road, SE15 Muschamp Road is one of the streets of London in the SE15 postal area. Naylor Road, SE15 Naylor Road was named in 1863 after a Miss Naylor who then leased houses in 1877. Nazareth Gardens, SE15 Nazareth Gardens is one of the streets of London in the SE15 postal area. Nigel Road, SE15 Nigel Road is one of the streets of London in the SE15 postal area. Nunhead Green, SE15 Nunhead Green is one of the streets of London in the SE15 postal area. Nutbrook Street, SE15 Nutbrook Street is one of the streets of London in the SE15 postal area. Oglander Road, SE15 Oglander Road is a road of late Victorian terraces linking Maxted Road and Grove Vale. Old James Street, SE15 Old James Street is one of the streets of London in the SE15 postal area. Old Kent Road, SE15 Old Kent Road is one of the streets of London in the SE15 postal area. Ormside Street, SE15 Ormside Street is one of the streets of London in the SE15 postal area. Oxenford Street, SE15 Oxenford Street is an early example of municipal building. Peckham Grove, SE15 Peckham Grove is one of the streets of London in the SE15 postal area. Peckham High Street, SE15 Peckham High Street is one of the streets of London in the SE15 postal area. Peckham Hill Street, SE15 Peckham Hill Street was named after Hill family who were local landowners. Peckham Park Road, SE15 Peckham Park Road was the combination of Park Road and Upper Park Road in 1870. Penarth Street, SE15 Penarth Street is one of the streets of London in the SE15 postal area. Pennethorne Road, SE15 Pennethorne Road is one of the streets of London in the SE15 postal area. Pentridge Street, SE15 Pentridge Street is one of the streets of London in the SE15 postal area. Philip Walk, SE15 Philip Walk is one of the streets of London in the SE15 postal area. Pomeroy Street, SE14 Pomeroy Street is one of the streets of London in the SE14 postal area. Radnor Road, SE15 Radnor Road is one of the streets of London in the SE15 postal area. Record Street, SE15 Record Street is one of the streets of London in the SE15 postal area. Reedham Street, SE15 Reedham Street is one of the streets of London in the SE15 postal area. Rollins Street, SE15 Rollins Street is one of the streets of London in the SE15 postal area. Ruby Street, SE15 Ruby Street is one of the streets of London in the SE15 postal area. Sandgate Street, SE15 Sandgate Street is one of the streets of London in the SE15 postal area. Scylla Road, SE15 Scylla Road is one of the streets of London in the SE15 postal area. Sharratt Street, SE15 Sharratt Street is one of the streets of London in the SE15 postal area. Shurland Gardens, SE15 Shurland Gardens is one of the streets of London in the SE15 postal area. Sidmouth House Lindley Estate, SE15 Sidmouth House Lindley Estate is one of the streets of London in the SE15 postal area. St Georges Mews, SE1 St Georges Mews is one of the streets of London in the SE1 postal area. St Georges Way, SE15 St Georges Way is one of the streets of London in the SE15 postal area. Sternhall Lane, SE15 Sternhall Lane is one of the streets of London in the SE15 postal area. Studholme Street, SE15 Studholme Street is one of the streets of London in the SE15 postal area. Sumner Road, SE15 Sumner Road is one of the streets of London in the SE15 postal area. Sylvan Grove, SE15 Sylvan Grove is one of the streets of London in the SE15 postal area. Talfourd Place, SE15 Talfourd Place is one of the streets of London in the SE15 postal area. Talfourd Road, SE15 Talfourd Road was developed by the British Land Company between 1857 and 1862. The Market, SE15 The Market is one of the streets of London in the SE15 postal area. Troy Town Flats, SE15 Troy Town Flats is one of the streets of London in the SE15 postal area. Tustin Estate, SE15 Tustin Estate is one of the streets of London in the SE15 postal area. Waghorn Street, SE15 Waghorn Street is one of the streets of London in the SE15 postal area. Wagner Street, SE15 Wagner Street is one of the streets of London in the SE15 postal area. Wentworth Crescent, SE15 Wentworth Crescent is one of the streets of London in the SE15 postal area. Whorlton Road, SE15 Whorlton Road is one of the streets of London in the SE15 postal area. Willowbrook Road, SE15 Willowbrook Road is one of the streets of London in the SE15 postal area. Wingfield Street, SE15 Wingfield Street is one of the streets of London in the SE15 postal area. Witcombe Point, SE15 Witcombe Point is one of the streets of London in the SE15 postal area. Wivenhoe Close, SE15 Wivenhoe Close is one of the streets of London in the SE15 postal area. York Grove, SE15 York Grove is one of the streets of London in the SE15 postal area.